The latest update on this story is available here. A 17-year-old North Texas student is accused of criminal solicitation of capital murder and making a terroristic threat in an Islamic State-inspired plot to carry out a mass shooting at suburban Dallas mall, officials said. The teen, Matin Azizi-Yarand, who lives with his parents in Plano, was arrested Tuesday at Plano West Senior High School and is now being held at the Collin County Jail on $3 million bond. Under Texas law he'll be tried as an adult and faces up to life in prison for criminal solicitation and up to 10 years in prison for making a terroristic threat. 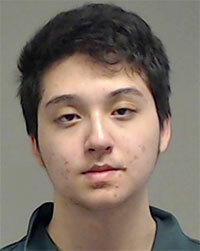 Matin Azizi-Yarand, 17, faces life in prison if convicted of an Islamic State-inspired plot to carry out a mass shooting at Stonebriar Centre mall in Frisco. Officials said in an arrest affidavit Azizi-Yarand talked online with a FBI source starting in December 2017 and told the informant how he wanted to conduct a terrorist attack. Over the course of four months, investigators said the suspect communicated with two informants and an undercover agent about possible targets that included an unnamed school, a Hindu temple and then Stonebriar Centre mall in Frisco. Officials said Azizi-Yarand said the goal of his attack was not a high death count, but rather forcing countries to spend more in security -- though a high death count could help "get their attention." Investigators said Azizi-Yarand was inspired by the Islamic State to conduct the attack, which, according to the affidavit, he planned to carry out in mid-May. He said he selected targets where he believed the police response time would be slow. He had also mentioned to the FBI source how he considered traveling to Pakistan and crossing the border into Afghanistan to join the Islamic State. At the time of his arrest, investigators said Azizi-Yarand had sent more than $1,400 to an informant for the purchase of weapons and tactical gear. He sent the source documents and propaganda, including a document authored by Eric Harris, one of the attackers in the 1999 shooting of Columbine High School, the affidavit said. Prosecutors said Wednesday Azizi-Yarand had written a letter he planned to disseminate, titled “Message to America,” explaining the reasons for his attack. Wednesday afternoon, Muslim community leaders denounced Azizi-Yarard's alleged actions. "He doesn’t speak for us,” said Khalid Hamideh, general counsel for the Islamic Association of Collin County. 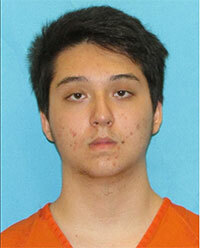 Tuesday, authorities arrested the suspect at Plano West Senior High School where he is a student. Plano Independent Schools sent a letter to parents that read, in part, "The student was arrested without incident. Law enforcement officials have confirmed that the offense for which the student was arrested was unrelated to Plano West, Plano ISD or any fellow students." Wednesday afternoon NBC 5 spoke with Azizi-Yarand's father, Reza Azizi, who said he had "no clue" what his son was planning and described his son as a "good kid" and a "good student." FBI Dallas Special Agent-in-Charge Eric Jackson said they are not aware of any additional threats associated with the teen's arrest and that the FBI "will continue to work diligently to protect and defend the United States and the communities we serve." The FBI Joint Terrorism Task Force, Plano and Frisco police conducted the investigation. Attorneys with the U.S. Attorney's Office said though Azizi-Yarand is a juvenile under federal law, the state of Texas considers a person 17-years-old an adult. "We determined that the recourse we had under federal juvenile procedure was inadequate to deal with the seriousness of this offense. Federal law limits our ability to certify a juvenile as an adult for prosecution, and in light of that, we determined that state prosecution of the subject will best address the case," said U.S. Attorney Joseph D. Brown. Brown said his office will work closely with Collin County DA Greg Willis on the case and will provide resources toward the prosecution including designating one of his attorneys to serve as a specially appointed Assistant District Attorney. It is not clear if Azizi-Yarand has retained an attorney. NBC 5's Diana Zoga, Meredith Yeomans, Frank Heinz, Eline DeBruijn and Holley Ford contributed to this report.